The site of this project is in the Scottish town of Burntisland and was picked to be able to explore and apply the idea of “urban wilderness”. Most of the cities and towns are affected by the industrialisation, growth and expansion of population, leaving behind a trail of abandoned and wasted spaces. Understanding the value of wilderness, the importance it can have in built environments and how this can affect the lives of those who live around it is fundamental to be able to use the unplanned spaces of cities and towns to create stronger ecological areas. In these wasted spaces vegetation grows spontaneously, in some ways re-creating the chaotic feel of a wild environment within an urban environment. 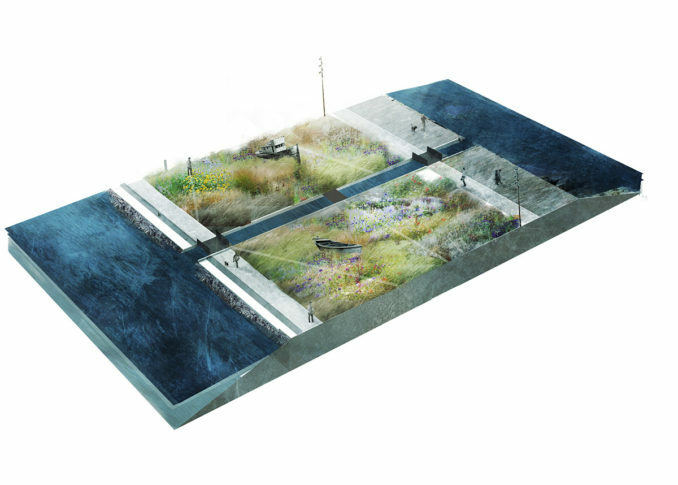 “Designing” wilderness and working with existing vegetation can offer us a new landscape typology; reaping the benefits of an ecologically rich environment whilst also restoring abandoned areas of a city. Burnt Island harbour is located along the coast of Fife, Scotland located along the Fife Coastal Path, which brings thousands of tourists to this area every year. Along the path it is possible to find sites of interest related to architecture, archaeology, cultural heritage, wildlife, but also a variety of active and disused industrial sites. 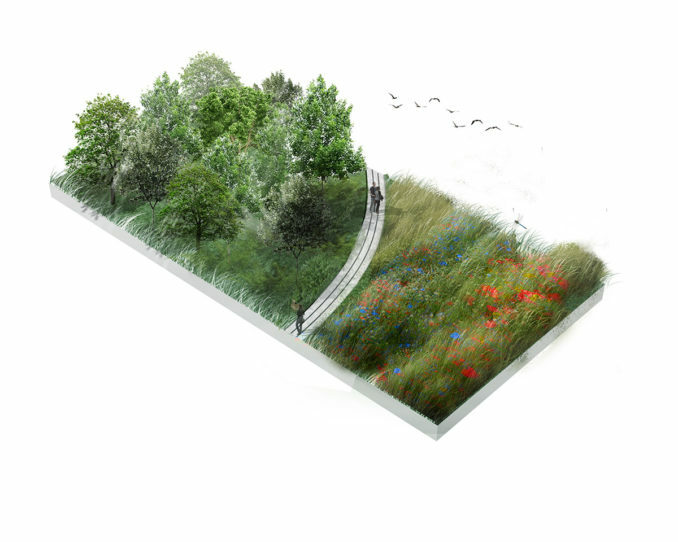 The presence of these fabricated spaces has impacts on the local biodiversity which led to the creation a wider strategy for the sites to become wild spaces would have positive effects on the local flora and fauna, while allowing the Coastal Path to also become a green corridor. 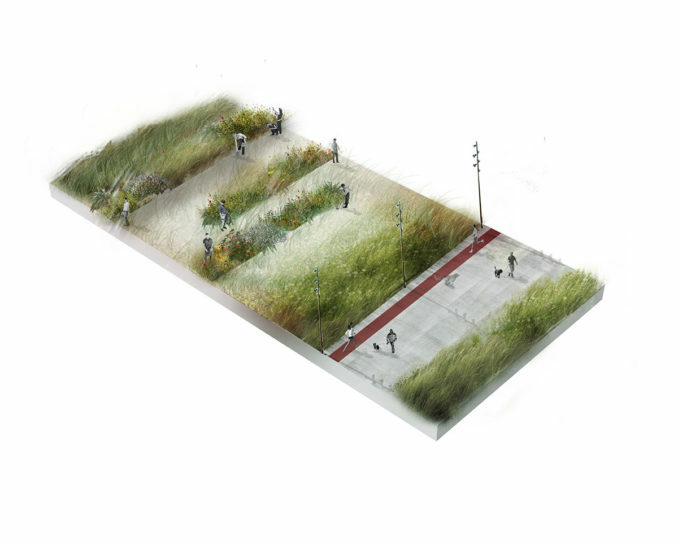 The overall aim of this project was to create and study how different ecosystems and landscape typologies can be re-introduced to sites altered by human interaction, creating ecological spaces that can revitalize brownfields sites and give them back to the community. The site has a significant industrial history. Burntisland for years was the main link between Edinburgh and Fife, which led to the construction of railway lines, allowing the exchange of goods and the passage of people. 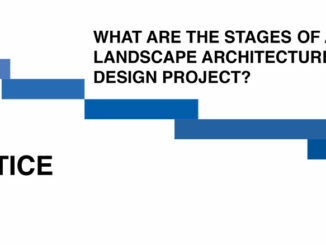 The railway lines have influenced the design of the landscape framework. 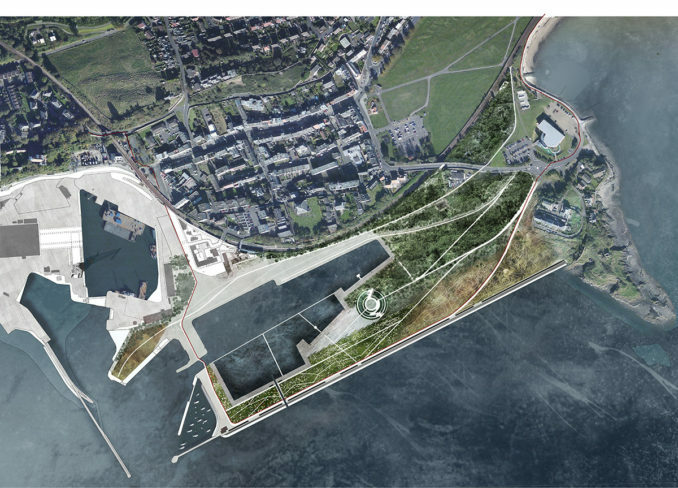 The harbour will be split into different ecological areas: broadleaved woodland forest, wildflower meadow, artificial dunes, hardscape and an artificial rockpool. 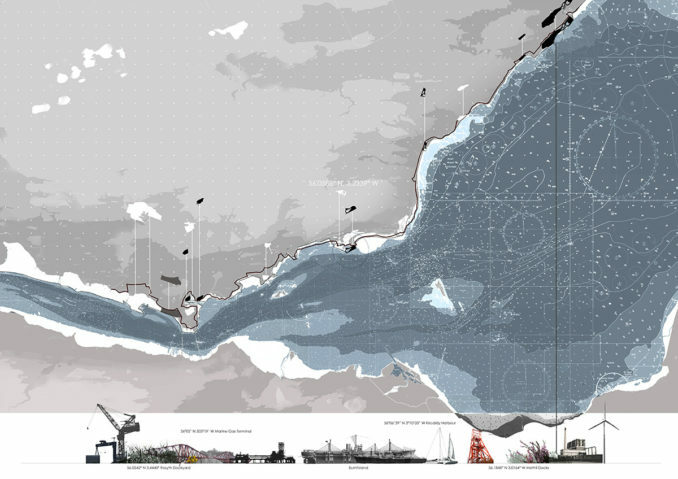 The section at the bottom of the page shows an example of the proposed artificial dunes. Development of broadleaved woodland, grasses, wildflower meadows and habitats for land and marine wildlife. Implementation of street furniture, lighting, services for the local community that uses the site for running, dog walking. Implementation of foraging garden to attract residents. The ruins and remnants of post- industrial sites offer the opportunity to create special places. 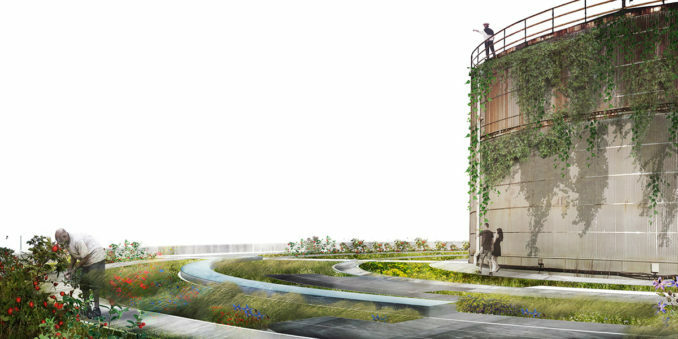 The circular tank will be a feature in the foraging garden while allowing people to admire the views from the harbour. 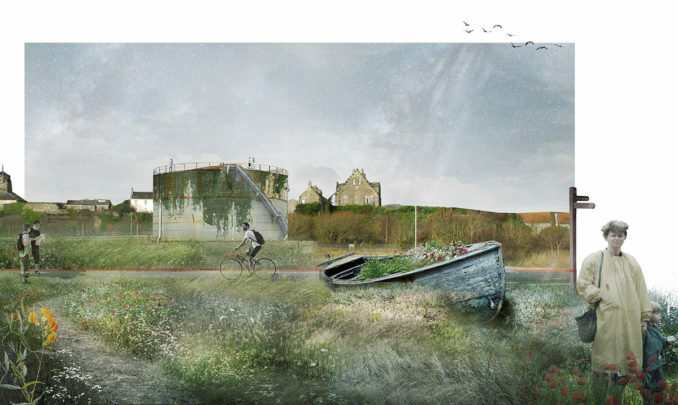 This will allow people to access the space of the water tank, creating further possibilities for local residents to get involved and have a stronger link with the site. The harbour will be transformed into an artificial tidal rockpool, attempting to revitalise the harbour and introduce marine wildlife. 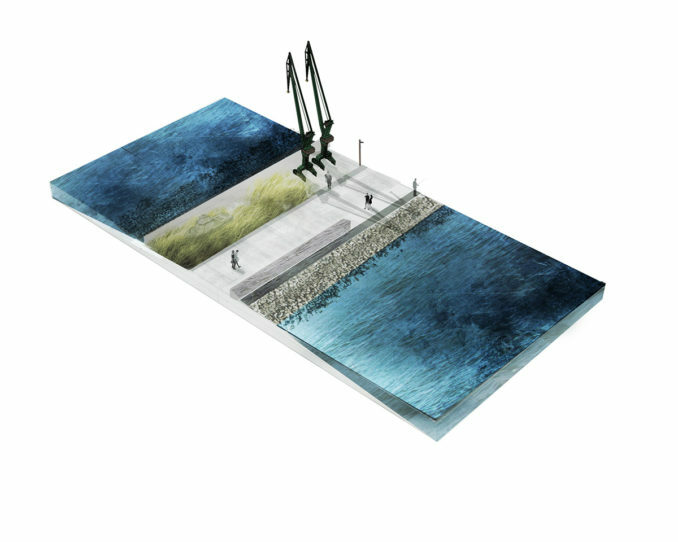 Several cuts through the harbour will be made, allowing the change of water, but only one will be visible. The main channel through the harbour follows the trajectory of the former ferry pier line where passengers wanting to reach Edinburgh had to embark on a ferry here. 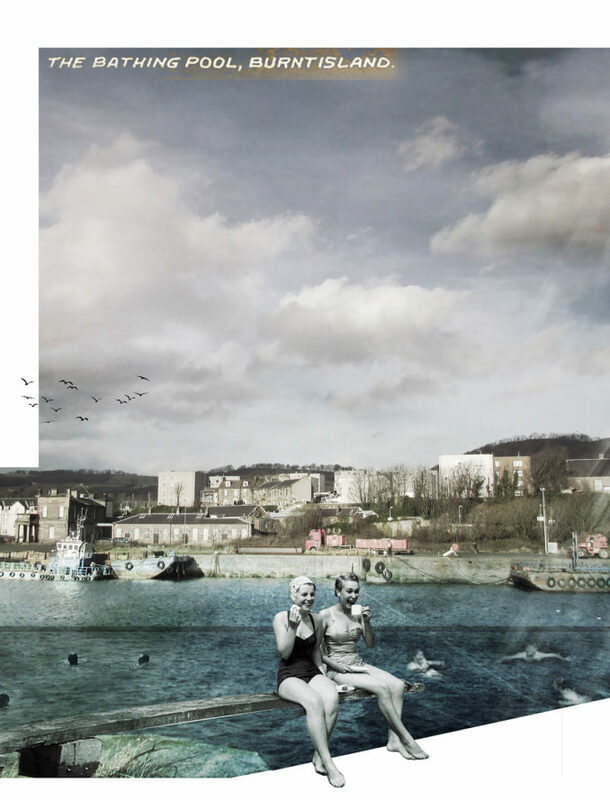 The flow of passenger was interrupted due to the construction of bridges in North Queensferry and this new channel would allow a new flow of water and wildlife to animate the harbour again. The remnants of building sites, excavations along the cost of other sites and other unused concrete will all be used to fill the space of the tidal rockpool.